Earlier this year, the Beatles' animated film Yellow Submarine was cleaned up for a reissue on DVD and Blu-ray. Next up, their 1967 film Magical Mystery Tour will receive a similar treatment. This previously out-of-print flick will drop on DVD and Blu-ray on October 9 through Apple Films. The live-action Magical Mystery Tour is just under an hour in length and is about a group of people (including the four Beatles) who embark on a psychedelic, acid-drenched bus trip. The footage was restored by the same folks who touched up Yellow Submarine, and the soundtrack (which features songs like "I Am the Walrus" and "The Fool on the Hill") was remixed for stereo and surround sound. 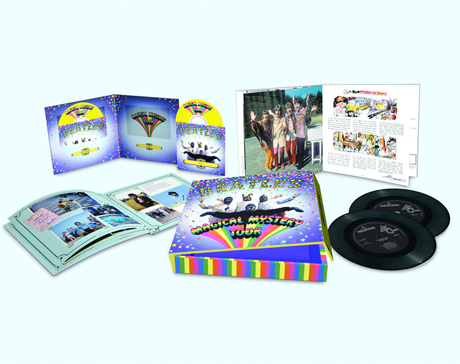 Those seeking the ultimate Magical Mystery Tour experience can purchase the 10"x10" boxed edition. It includes both the DVD and Blu-ray versions of the movie, along with a 60-page book and a double 7-inch EP containing the film's six original songs (this version recreates the soundtrack's original UK release). For the first time ever, the film will also receive a limited theatrical release on September 27. While the participating cities and theatres have yet to be confirmed, there will be Canadian screenings, according to the press release. The film, which was directed by the Beatles themselves, received poor reviews upon its original release. We'll have to see whether time has made the critics any kinder.